Arkadia Pest Control provides award-winning, cost-effective, environmentally-friendly pest control in New Jersey for residential and commercial clients. Our two office locations in Rockaway, NJ and Randolph, NJ, allow us to provide eco-friendly pest control services to 13 counties in New Jersey. Excellent. Reliable. Most importantly, they stand behind their service. This is the third consecutive year I've used them and I will continue to use them in the years to come. Great service. Always on time and representatives are caring and knowledgeable. Very happy with the service but, the best is how eco-friendly your products are and pet friendly as well. Arkadia's staff is responsive, friendly, on-time, and I am always happy with the results. Always on time with a call before to let me know they’re on their way! Great job with organic methods of keeping pests at bay. I’ve been a customer for several years and am quite satisfied. Great customer service! Overall excellent company. Always very responsive. Thank you. Responsive, careful, communicative, and friendly. Oh, and what they did seems to have worked. The swarms of flying ants are no where to be found except for a few large stragglers. Thanks!! Excellent customer service. Professional and knowledgeable technicians. Works great! Always prompt, responsive & professional! on time, explained things well. thank you. We still have ants, but more dead than alive. Follow up visit has been scheduled. We’ve used Arkadia for years. Their yearly plans AE affordable and I love having the non-toxic treatments as an option. Arkadia is a pleasure to work with. Always friendly and easy to schedule appts. We love using natural measures whenever possible for pest care. Thank you for giving us that option. Thanks for providing excellent responsive, professional service - on the phone and in the field. We normally do not buy annual contracts, but have found it worthwhile to do so with your company. The monthly spray treatment reduces mosquitoes (and makes the yard smell great!). We also are pleased with the ant treatments. We are very excited to have effective, non-toxic options for pest control. Arkadia gives the best service. They are very accomodative to your home needs. Phone call back when we have been playing phone tag was appreciated. Even more appreciated is that they took the Weather forecast into consideration so I would not have to reschedule. I love that I never have to worry about pests anymore. With the plan I chose, they come as often as I've requested and are always pleasant. I also love that I don't have to worry about toxic chemicals in and around my household that includes children and a pet! Always great service! Friendly staff. Thanks! 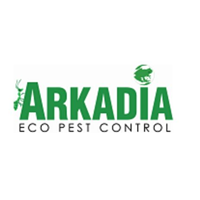 I've been using Arkadia Pest Control for about a year now.They only use organic materials that are pleasant smelling and have no side effects.Their people are always polite and well mannered and do a thorough job.They are very responsive if you have a problem and immediately send someone to take care of it.I have no complaints at all and plan to continue to use their services. How can I rate it -- you showed up to do an outside treatment without letting us know, and so we weren't even home. I have been with ARKADIA for years! Professional, friendly, timely and always satisfied. I recommend them to all my friends and family. Even my neighbor reached out after seeing what a through job they did and discovered they are green. James arrived when he said he would. I showed him the problem areas. He recommended treatment, explained what he would do and then did it. Drew was fantastic!! He answered all our questions and took fantastic care of our home and got rid of the pests! He was thorough and made sure to check all areas we mentioned! James was most professional and attentive to my concerns regarding ants, as well as, recurrence of mice in my basement. There is no question that I will always recommend Arkadia to friends and neighbors. Great job. Thanks again. Will continue to use your service exclusively. Drew was excellent and addressed all my needs. As a holistic health coach I am thrilled to use Arkadia. It is wonderful to be able to control my pest problems without dangerous chemicals. I have been thrilled with this wonderful company. Arkadia is very professional and friendly staff. I can always count on them. They are very knowledgeable with their work and get the job done right each and every time. Good service, quick appointments, natural pest control. Matthew always goes above and beyond!